We were walking the dogs when Hobo refused to pass the wheelie bin. I opened the lid and there were faint cries coming from a bin liner. I took out the bag and opened it to find six newborn kittens. Five black ones -all dead - and one almost white, still alive but only just. Of course I took the little one indoors and made up some kitten milk replacer, which he took with relish from the premie bottle. I made up a box with a hot water bottle under loads of towels, quite expecting to find him dead in the morning. This little guy was a fighter. Not only did he survive, he thrived. A friend of mine's husband kept goats and she brought me some goat's milk, which apparently is the nearest to queen's milk. I sweetened it a little and he loved it. Three years later he is a total cuddle bunny and so naughty! He knows exactly how to get attention, from climbing up my leg to jumping up on shelves with the inevitable result of falling and broken ornaments. He wakes me in the morning by kissing my face, and if that does not work then he makes puddings on my chest. Whatever I'm doing he likes to "help". I mostly do my beadwork with his bum in my face. He's three years old now and I just adore him. I doubt that Tai-Tai is a purebred but I'm just so lucky to have found him. Ko-Ko is a pure Seal Point and came to me for re-homing as his owners relocated back to their native South Africa. Unfortunately they left the cat behind and I was told there was a cat crying in a neighboring garden. Sure enough Ko-Ko was there in the now empty property but it took several days to catch him as he was very nervous. He was around nine months old then. In the end I managed to get him in the cat trap. Needless to say I didn't look very hard for a new home for him, as he and Tai-Tai became instant buddies. 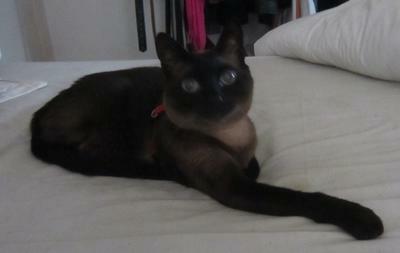 Ko-Ko is very much an indoor cat, preferring to spend his days resting on my bed or watching TV. He is still rather nervous and runs to hide whenever someone comes to the house. He is definitely the aristocat of the family. I would just like to add a small memorial to my nineteen-year-old grey tabby Tico-Tico, who went over the Rainbow Bridge this week. Tico was born in a builder's wood pile intended for a bonfire. His mum, who I called Misty, was very pregnant when I first saw her near there, so I used to put food and water out for her. Bit by bit she got braver and eventually came to the house for food, but would not stay. Then for several days I did not see her, and I guessed she had given birth to her kittens. Several weeks down the line, I went out to put food down for her as usual, and there she was, so thin, with her five kittens. She had brought her kittens to meet me! Now she wanted to come indoors which she did ... and stayed. I managed to find homes for four of the kittens but the little tabby one was not amongst them. Then one morning I heard desperate baby mews outside my door. I opened it and there was the little tabby. He looked up as if to say "is my Mum living here?" He walked in the door and made himself right at home, cuddled up to his mum. We called him Tico-Tico which means little person or thing in Portuguese. Safe journey over the Bridge little man. Thank you for nineteen wonderful years. 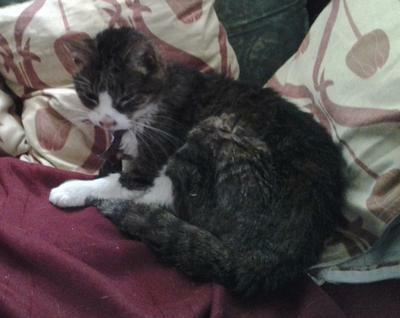 I meant to add that mummycat Misty stayed permanently with us, living for a further 16 years with her son. She died just a year before him. What a lovely story. I hope your kitties go on to have a great life with you and am sure they will. I loved hearing about Tico-Tico! And that you are in Lagos! We live near Amarante in the north of Portugal, and 5 years ago we found a tiny seal point kitten on a Praia Fluvial/river beach on a day that was 44º C! VERY hot ... and we knew she wouldn't survive that for long. We were worried about taking her in our car with no basket etc, but she just sat up in the back of the car like she owned it, between my son and his partner! She is a snuggly cuddle bunny too and hangs over my left shoulder or more often is to be found hugging me around my neck with both paws like a little monkey! I have my own photos and comment about them on here somewhere! Note from Caroline: Good to hear from you Susan! And I'm glad Saffy's still doing well. Your page with photos can be found here. I am looking on behalf of my friend Sharon as she has lost her Siamese after a very long life and also her litter mate some years ago. She is in a beautiful condominium in Victoria British Columbia and her cat has been, and subsequent cats will always be, inside cats and live the life of luxury, with the best of food, hot water bottles to sleep with on her bed (if they are sick or elderly) and constant attention. She is really wanting to offer a home to a Siamese or Siamese Cross as she has always had these beautiful cats. She would prefer a kitten or younger cat as she wants to be involved in the training and nurturing of them but as I know her kind heart and loving nature, she may also look at a middle-aged cat in need. She does not want an older cat as she does not want to go through the loss of them as she has recently had to go through this. Note from Caroline: Martha, you're a very kind friend! For kittens, take a look at our Canadian breeders page. Unfortunately I don't know of many specifically Siamese rescue shelters in Canada but there are links to two on our list of rescue centers page. Valerie, thank you so much for your story and I'm so sorry for your loss of Tico-Tico. 19 years old is a good age for a cat though and it sounds as if he had a wonderful life with you, which is all any cat could ask for. 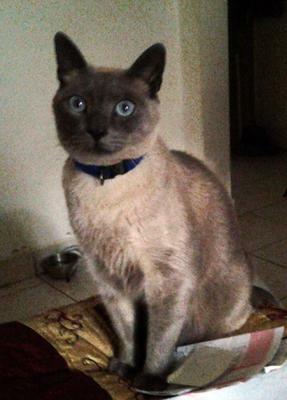 I loved the pictures of your Meezers, too, and how lucky are they, and you, that you all found each other! I hope they both have as long and happy a life with you as Tico-Tico did.